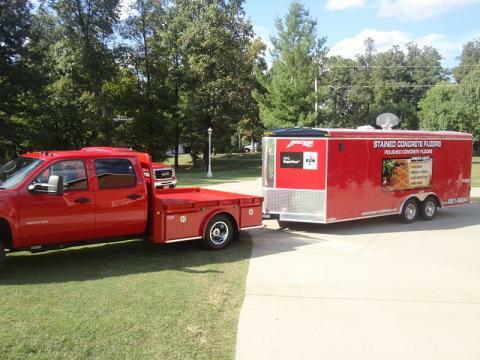 Based in Greenbrier, Tennessee, Unique-Crete Designs provides service to the Middle Tennessee area, including Nashville, Brentwood, Franklin, Hendersonville, Gallatin, Clarksville and Springfield. The family-owned business offers one-of-a-kind concrete finishing solutions, overlay systems and much more. Unique-Crete Designs is certified for Retro Plate Concrete Polishing System and HTC Superfloor. There's something quite satisfying about walking in to a spotless, freshly cleaned home - especially when it belongs to you. And let's face it, the floors are where it all begins. It's nigh on to impossible to recapture that clean with a carpet, as it clings to allergens, dirt, dust and hair - affecting the odor of a home as well as the health of its inhabitants. And forget about tile and its dirt-magnetic grout or vinyl, which fades, peels and yellows. Of course, wood floors are popular but removing the stains can cost an arm and a leg. The most economical, durable and creative selection? Unique-Crete Designs' polished or stained concrete. Who knew something so smart and economical could be so beautiful?